Welcome to another Top 5 list, the Top 5 Reasons to achieve Financial Indendence (FI). I’ll admit, it wasn’t easy whittling this list down to 5. Being FI, you’ve got a nest egg that should support you indefinitely. Work becomes optional. That’s right, you can choose how to spend your days. If you’ve longed for a 3-day workweek, now is the time to make that a reality. If you’ve wanted to do some teaching or research, but had chosen private practice for the better pay, now is the time to explore that academic position. If you’re fed up with the shenanigans of your hospital and governmental administrators, and you’re mad as hell and can’t take this anymore, you don’t have to take it anymore. You can afford to take a sabbatical or walk away for good. By investing in your future, you’ve bought yourself options. 2. You are now self-insured. Remember the nice, young gentlemen who bought you dinner during residency and sold you some necessary insurance products? The one who sends you a “Happy Holidays” card every year and sends random e-mails to make sure your insurance needs are being met? You’ve got an unpleasant task ahead, because breaking up is hard to do . 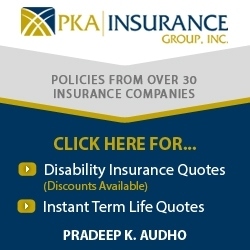 Disability insurance is a very good idea for any young physician, and if you’ve got a family depending on your income, term life insurance is paramount as well. You need money in case you can’t work due to injury, and your family needs money if you can’t work because you died. Guess what? If you already have enough money to support yourself and your family without a biweekly paycheck, you don’t need to insure against losing that income. I would guesstimate that many physicians spend about $5,000 a year on these insurance premiums. Being FI allows you to put that money to work somewhere else. You could put $5,0000 into a child’s 529 fund or donate about $9,000 to your donor advised fund or other charity. 3. Start working for others. Why strive for financial independence when you have no interest in retiring early? You can keep working of course, but now you can start working for the benefit of other people. You don’t need the money, but there are others that do. By virtue of having a high salary for a number of years, you have been “donating” all along, but the government decided where the money went. Now, you can give your earnings freely to people and projects that are meaningful to you. You may want to help a relative who is struggling. You may want to fund an expansion at the local dog shelter or food shelf. Giving to charity not only lowers your taxes, but it makes you feel good too. Functional MRI has shown that we like to give, with areas of the brain associated with pleasure lighting up when we choose to give our money to causes we deem worthy. Achieving FI allows you to give more freely and generously, helping others in need while simultaneously boosting your own happiness. To paraphrase a common saying, “stuff happens”. All kinds of stuff. And some stuff is bad enough to require a leave of absence from your day job. If you are in your forties or fifties, you might have parents in the seventies or eighties. You might even have grandparents, perhaps now in their nineties. All kinds of bad can happen to people at those advanced ages. Wouldn’t it be wonderful to have the ability to leave work behind without worrying about how your bills will be paid? Badness can befall you too, or a spouse or close friend, or God forbid, one of your children. Financial Independence gives you the irreplaceable ability to be with loved ones in a time of need. Money can’t buy compassion, but it can buy the time you need to show compassion when it’s needed most. 5. Evaluate the relationship between your spending and happiness. Recall that the key variables in the FI equation are the size of your nest egg and the amount of your annual spending. You are FI when the nest egg has X years of expenses, where X is a number like 25 (or perhaps 33 or 40 if you want to be really safe). You can get closer to FI by growing your nest egg and/or by decreasing your expenses. Injecting a dose of frugality into your life can help you learn what truly makes you happy. Studies show that happiness pretty much plateaus once the household income hits $50,000 to $75,000. If you’re spending twice that much, you may be squandering a lot of money for very little added enjoyment. I like to think of the spending / happiness ratio in terms of a Frank Starling Curve of Happiness. Replacing stroke volume with happiness and LVEDP with spending and leaving the overall shape alone gives us a pretty good representation of reality. 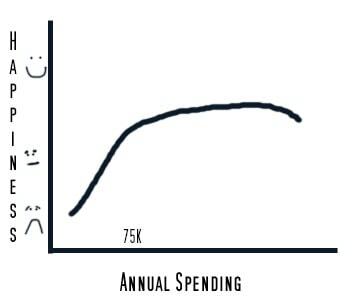 When we start from 0, we see increasing levels of happiness with each additional dollar of annual spending. Once we reach a level of spending in the $50,000 to $75,000 range, the curve nearly plateaus. Additional spending may give us little boluses of happiness, but they are fleeting. Once our spending approaches or exceeds our take-home pay, we see a decrease in happiness. Call it congestive spending failure. We’re adding stress to our lives by going deeper into debt, not saving for retirement, and living a life that is unsustainable. What do you think? Are these good enough reasons for you to want to become Financially Independent? What other reasons might be in your Top 5? Start the discussion in the comment box below. The biggest benefit I found was no longer caring as much about what other people think, and only hanging out with people you WANT to hang out with, not people you feel you need to hang out with for career advancement etc. Thanks for stoppping by, Sam! It’s great to have insight from someone like you who has left the “rat race”. Your comment is perfect; I wrote a draft of the Top 5 reasons I didn’t retire by 40. I have 4 other good reasons, but the 5th is that I DO care what people think, for better or worse. It will be easier for me to justify leaving the profession when I have a bigger financial cushion and at least a few more years of work under my belt. Great reminder about staying healthy now and through retirement…especially for this 42 year old who wants to live to be a healthy 90-something and has at least another 7-12 years until FIRE. Thank you, I’ll be following! Thanks for following! Staying in decent shape is especially important if you want to be 90-something or 100 like Tawcan. Even if you do live that long, those later years won’t be so enjoyable if you don’t have decent health. I think breaking free from the mindset that more spending leads to more happiness can allow one to better achieve freedom and happiness. Such a great post. We’re hoping to be able to help support our nieces, nephews, and little cousins through their education in a few years. It’s super-exciting to be able to stop thinking about “how are we going to pay the bills?” and brainstorm how to help others. Sounds great, Julie! FI is a good place to be. So many options, particularly when you’re still working. Perhaps someone can answer this question. I was using firecalc yesterday and ran a calculation using total market at 70/30 for my portfolio and was trying to investigate what the spending level at 95% confidence would be. So I put my numbers in and got a dollar amount. Next, I ran the same calculation except instead of total market as my portfolio I put in the following and got 20% more income. Pardon my ignorance but can someone please explain why and if this could be a good strategy in retirement since it appears that it will produce more and allow me to retire earlier. I can’t say why you got that result, but at first glance, it doesn’t make much sense. A 70% stock portfolio would likely outperform a 50% stock portfolio over the long haul when using past performance as a guide. I wouldn’t base your asset allocation on the results FIREcalc gives you. I’d go with a simple three-fund or four-fund portfolio with percentages that align with your risk tolerance. The number one reason for me and Mrs. FR is we can work when we WANT, how we WANT it and do what we WANT. Instead of doing what we NEED to do and so on. Yes, FR. When needs can be replaced with wants, life starts looking a lot more fun and perhaps more fulfilling.